Earlier today, we said that the McLaren X1 was freaking insane from the press pictures. Well, Macca just took the wraps off of the X1 here at The Quail, and I can confirm that it is one of the most nuts vehicles ever conceived. It literally looks like it is freaking insane. Details on the buyer are still scarce, but this thing is ridiculous. I just spent about 20 minutes ogling it, and it is incredible from every angle. It's like a space ship, but not totally. It's just a lunatic. When I get some Wi-Fi that works worth a damn I'm going to upload some more shots. 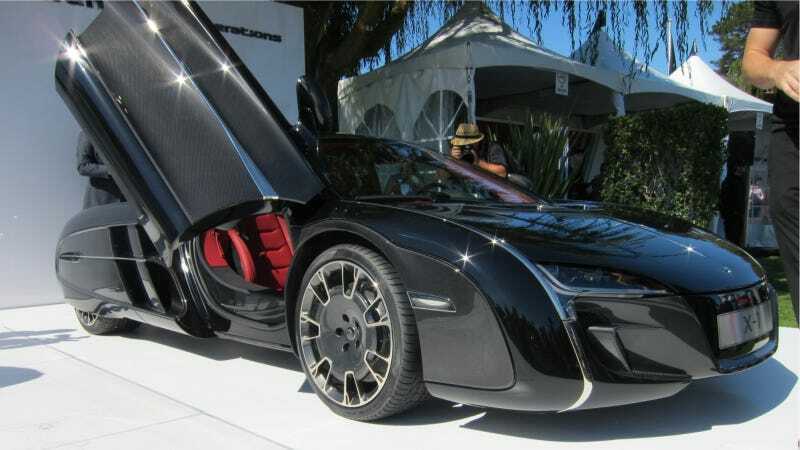 The doors have a pure carbon fiber weave. The engine cover is a billet piece that was milled down to the work of art you see on the car. It is MP4-12C-based, which is apparent in the interior. Also, nobody else will probably ever see it. After today, the X1 will be going directly to the owner's home, where he will probably never drive it. That's a shame. Things like this need to be on the road.